Welcome to the seventh tutorial in our series about Google DoubleClick for Publishers. DFP is a service that can seem incredibly complicated to the uninitiated, so our series has aimed to simplify it (while possibly annoying a few Google product managers for pointing out its numerous UX missteps). 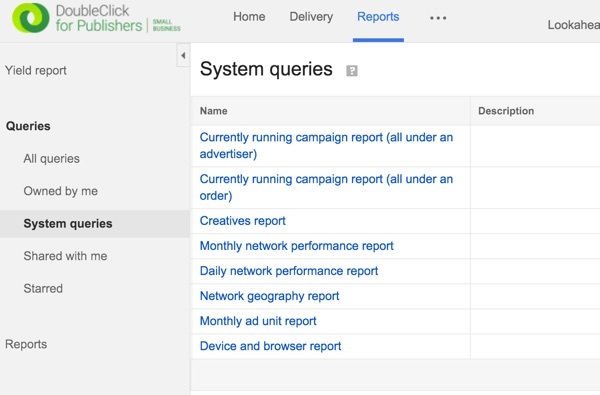 In this tutorial, I'll guide you through Google DFP's Query and Reporting options, exploring the differences between queries and reports and the various ways to gather data about the performance of your web advertising. For consistency, the DFP team has made these look as complicated and confusing as other parts of the DFP interface, but if you study them for a while, queries and reports become fairly simple to use. If you're new to this series, please review our earlier episodes before continuing: Introduction to Google DFP Small Business, Beginning Ad Integration With Your Website, Placements, and Placing Orders. I do try to participate in the discussions below. If you have a question or topic suggestion for a future episode, please post a comment below or contact me on Twitter @reifman. How Do DFP Queries Differ From Reports? Essentially queries and reports are the same thing. 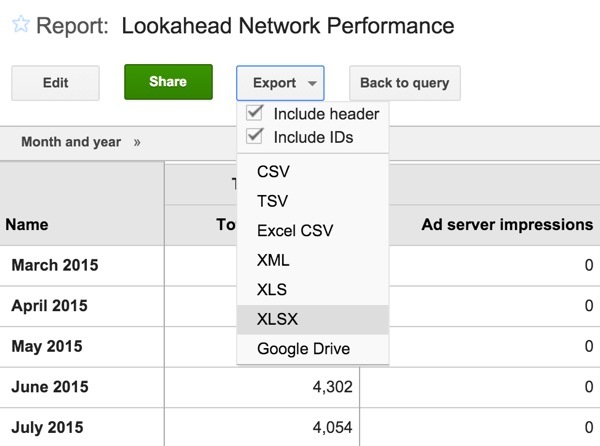 However, when you want to run just a quick, one-off ad-hoc report, you can use the Reports menu. 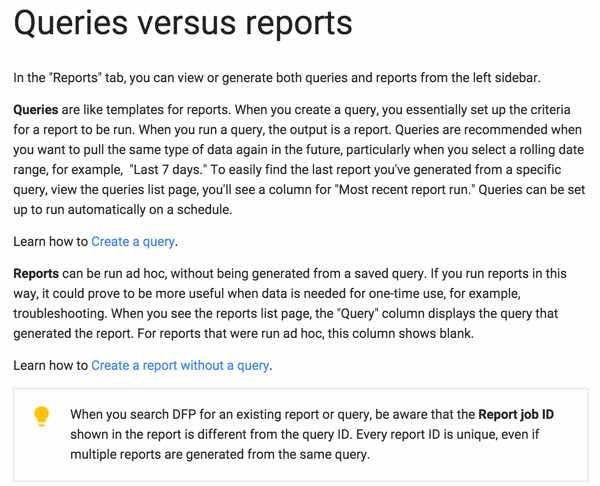 When you want to create something that will run repeatedly, it's not a Report that recurs (Dear Google UX team, that would be simpler), it's a query. Also, the I'M DONE button seems to be both a button and a checkbox. This is odd. If we could get by without ad revenue, I'm sure a lot of us would check and click a button entitled "I'M DONE WITH DFP." Queries are like templates for reports. When you create a query, you essentially set up the criteria for a report to be run. When you run a query, the output is a report. Queries are recommended when you want to pull the same type of data again in the future, particularly when you select a rolling date range, for example, "Last 7 days". To easily find the last report you've generated from a specific query, view the queries list page, and you'll see a column for "Most recent report run". 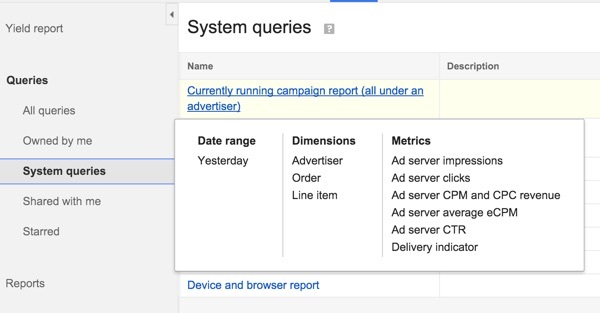 Queries can be set up to run automatically on a schedule. You can use DFP's system queries, another poorly named term, to run traditional advertising reports without having to create your own query. Detailed filtering through the use of dimensions and metrics, performance breakouts by week, quarter, or month, as well as fixed date ranges and on demand editing. 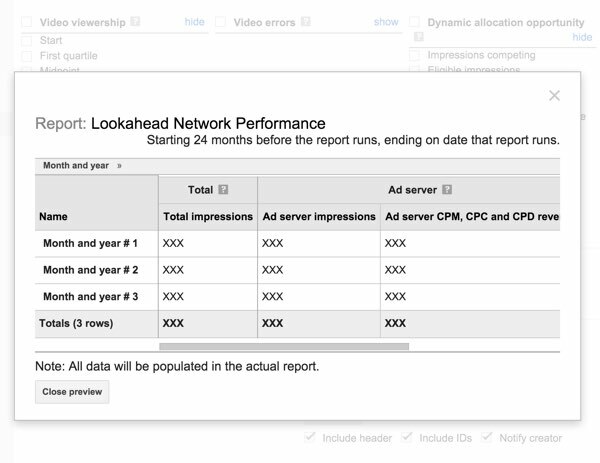 Preview queries to quickly see what your reports will look like without having to actually run them. 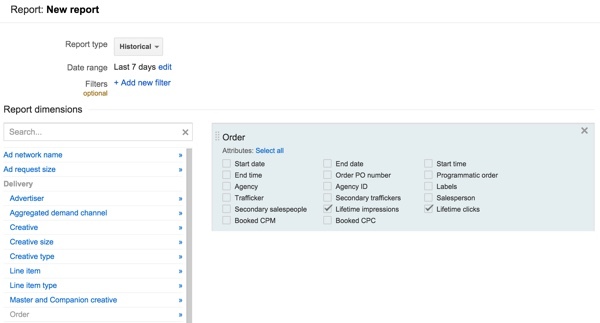 Reports can be run ad hoc, without being generated from a saved query. If you run reports in this way, it could prove to be more useful when data is needed for one-time use, for example, troubleshooting. When you see the reports list page, the "Query" column displays the query that generated the report. For reports that were run ad hoc, this column shows blank. 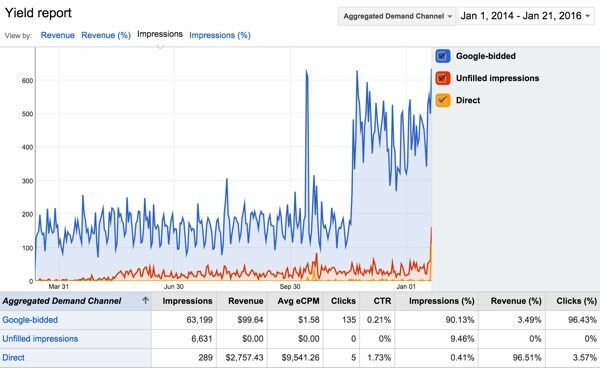 Historical: View data on clicks, revenue, click-through rate, and total impressions for dates in the past. Future sell-through: View data on sell-through rate (STR) and forecasted, available, and reserved impressions for dates in the future. Reach: View the number of unique visitors exposed to different advertisers, orders, line items, or ad units in your network over a given time period. Business intelligence: View data on the revenue earned and impressions gained from the buyer or advertiser on both DFP and the Ad Exchange, as well as the aggregate revenue. Data protection: View data on cookies that are detected for each creative added to DFP, broken down by advertiser, order, line item, creative, and the specific technology vendor from which the cookie originated. Sales: Run reports for DFP sales management. DFP sales management must be enabled in your network to see this report type. Yield Type, showing either direct sales (standard or sponsorship), house or remnant inventory, or unfilled impressions. 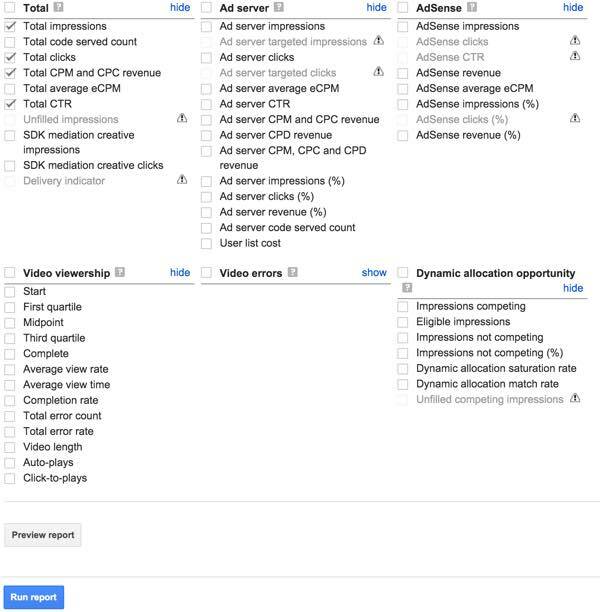 Aggregated Demand Channel, which shows you an aggregation of revenue by: Direct (includes revenue from all standard, sponsorship and click tracking line items), Google bidded (AdExchange/AdSense/AdMob line items), Third-party demand (includes all bulk, price priority and network line items) and Unfilled impressions. You can find the missing description fields for System Queries here. Currently running campaign report (all under an order) shows the performance of a specific client or house ads over time. Creatives report shows which ads (creatives) are performing well (and poorly). 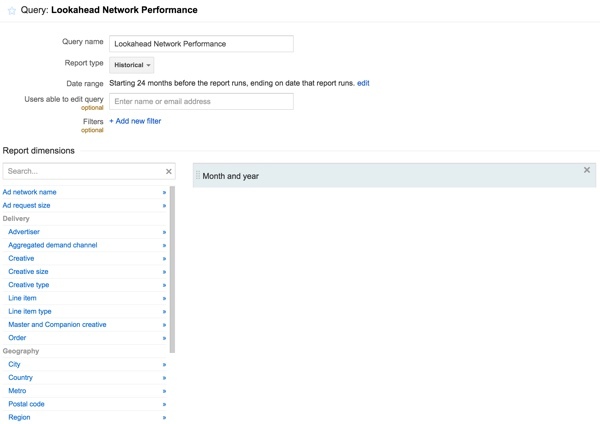 Monthly network performance report shows the performance of your entire account over the past month. 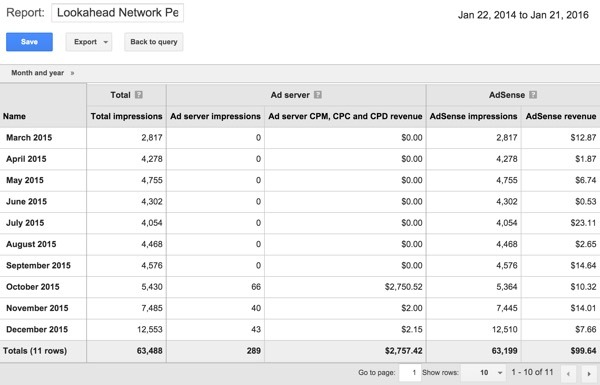 Monthly ad unit report shows the performance of the locations (ad units) of ads across your site(s) in your network. 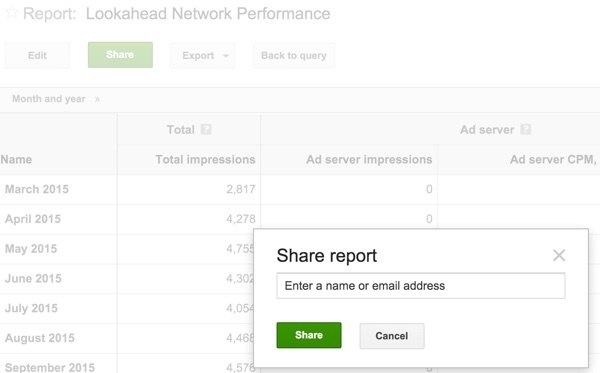 This can show you which areas of your site perform best (or worst) with ads. Before you create your own query from scratch, I recommend experimenting with running and editing one of these System Queries to your liking. Let's do this first. On the Queries page, click New Query. You can name the query and begin a broad array of open-ended configuration options for what you want. 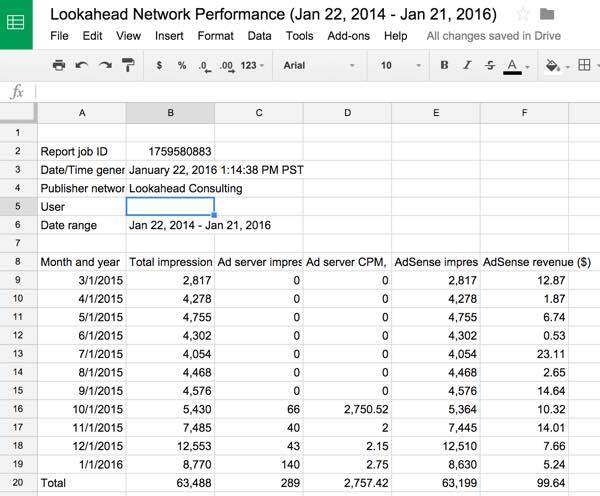 In this case, I wanted to create a Historical report for two years of my network's performance showing the basics: impressions, CPM, CPC, etc. For this I asked for a historical report over the last week showing lifetime clicks and impressions as well as CTR, CPM and CTC. If you visit the Reports menu, you'll see a list of reports and when they were created. Recurring reports will appear here as well. People who are not registered in DFP only receive an attachment of the report; they do not have access to the DFP user interface. Google doesn't allow sorting within its reporting interface, saying, "Generally the idea is that most developers prefer the report in a basic format like CSV so they can import and manipulate it themselves as they wish." If you've been following along with the series, I hope you're beginning to feel more proficient with the basics of DFP. It's not easy to dive into. Queries and reports are also more complicated than they should be. Its System Queries make reporting quite simple once you get to used to the user interface. The recurrence, sharing and export are quite powerful as well. While I've noticed that the folks at Google have tried to improve their help and documentation, they really need to redesign a lot of the system and update their terminology. It's not helpful to have to repeatedly leave a web application and dig through long technical explanations. As the series evolves, I'd love to hear more of your feedback about DFP topics you'd like me to explore. Please feel free to post your questions and comments below. You can also contact me on Twitter @reifman. To see other tutorials I've written, browse my Envato Tuts+ instructor page. 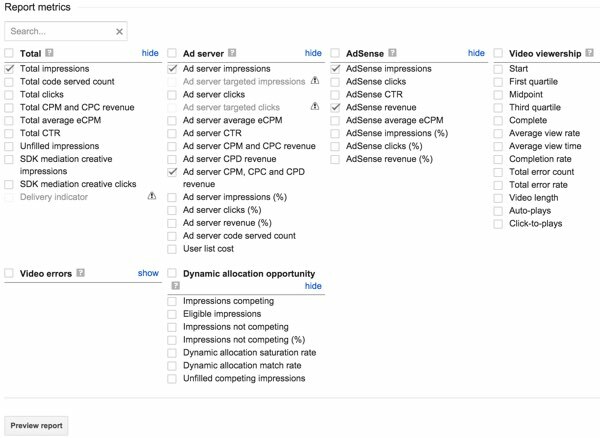 In the next episode, we'll explore selling directly to advertisers and placing their orders for your ad units and placements within Google DFP.